Roosevelt “The Dr.” Collier, who currently performs as a member of the Snarky Puppy spin-off band Bokanté, released his solo debut album Exit 16 earlier this year. Raised in the House of God Church in Perrine, Florida, Collier represents the younger generation of “sacred steel” guitarists. A master on both pedal and lap steel guitars, he also performs with his uncles and cousins as the Lee Boys, one of the foremost sacred steel ensembles., and in his spare time graces the stage with the likes of the Allman Brothers and Los Lobos. For past decade Collier has been touring as a solo artist, but it took ten years for this project to get off the ground. Rather than drawing upon previous work, Collier worked with Mike Lee, among others, to create new material for the album. He’s joined by Bokanté bandmate Michael League on bass, as well as Bobby Sparks on organ and clavinet, and Jason ‘JT’ Thomas on drums. Together they create what Collier refers to as “dirty funk swampy grime,” and indeed they lay down a groove so thick you’ll be forced to stick around for the ride. Another stand out track is “That Could Have Been Bad,” a fuzzed out blues rock exploration with a psychedelic edge that’s very bad indeed. The album closes with “Spike,” a slow grinding groove that’s definitely mired in the swamp, with a solo reminiscent of Hendrix that reaches the sonic limitations of Collier’s instrument. 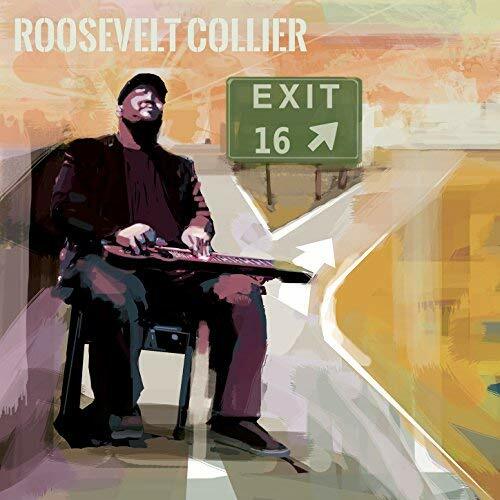 Exit 16 is a fantastic and long overdue debut album, with Roosevelt Collier demonstrating his technique and artistry on pedal and lap steel guitars through a genre-bending, mind-expanding explosion of sound. This entry was posted in Blues, Popular, Rock, and Misc. and tagged Brenda Nelson-Strauss, CD review, Exit 16, Ground Up, Jazz, Roosevelt Collier by aaamc. Bookmark the permalink.